Spooking the XBox and guaranteed to fright, Disney's The Haunted Mansion is finally here! But the question that was raised immediately was, is Eddie Murphy here? I hope not! In went the disc and you could sense my relief once I found out that it dealt with the haunted house ride that is actually in Anaheim USA, home of the original Disneyland. I was lucky enough to go to Disneyland many moons ago and can actually vouch for this game having many of the same characteristics as the original ride. Possibly the main thing to realise with this title is that it's one that the kiddies can get into for a light hearted thrill as well as the older folk, however if you were planning on a scary game, then this really isn't the title you need to be visiting. The game follows the story of Zeke Halloway who is desperately looking for work. 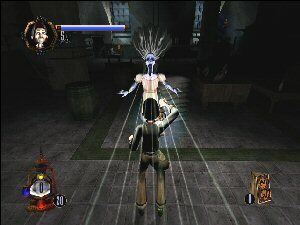 He enters the mansion and is trapped by the spirits and other nasties that are in there. This is where you come in and have to help Zeke capture the evil spirits and light up parts of the mansion that are too dark. I must admit that I was impressed by the detail in this game as quite often I've found that the Disney titles normally aren't the best looking things you've ever seen, however from my memories of the Haunted Mansion ride and what you see in the game, there has been a fair bit of thought put into textures and colours when creating this title. Whilst it certainly won't win any awards for Best Looking Game (TM) or other related awards, there are some really nice effects involving light and shadow that are certainly worth a mention and the way that the characters in the game interact with each other is convincing in a cartoony way. There are very little collision problems with the title and the way that Zeke moves about, you have no difficulty in making the leap of faith that he is really in the environments you see him in as opposed to just pasted on top of it all. 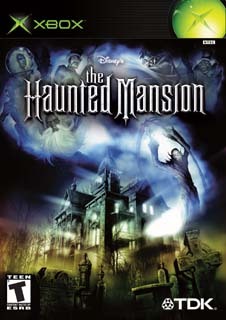 Zeke operates under the instructions of one Madame Leota who is a face trapped in a crystal ball and the other haunts that inhabit the mansion and are fearful of the evil spirits that roam about as they please. 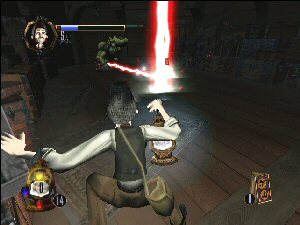 The game caters itself to many different types of players incorporating action and puzzling elements that Zeke must solve in order to proceed further into the game. Not all are simplistic in nature and younger gamers might need a hand from an older friend in order to sort them all out. Armed with the Beacon of Souls, which is essentially a magical lantern that Zeke can use to shoot the ghoulies out of the sky in order to get them out of the mansion and restore order and light to the rooms where the haunts haven't been able to access freely. Of course where there are evil spirits in groups there always has to be the one boss spirit and in this case his name is Atticus Thorn. Zeke has to make his way to the light switch in each room and battle whatever is thrown his way in the interim. It did remind me a bit of Luigi's Mansion for GameCube in a way, however is so sufficiently different that you won't truly draw that comparison unless you are forced to sit back and assess the game in an environment such as this, a game review. Even some of the puzzles such as making instruments play were something that I did in Luigi's Mansion but it still proves to be an enjoyable experience. Other tasks involve getting shrunk and all sorts of merriment that will provide a very good distraction from the main job of shooting and capturing bad guys with your lantern, which by the way is upgradeable by finding gems and following the hints provided by Madame Leota. Upon request gamers can ask for hints in each room and Leota will provide them to make of what you will. None are too cryptic and it's fun to have this kind of interaction with the game and the feeling that she is helping you out is also present. Zeke has a courage meter that acts as a health bar and if he gets touched by the ghosts too many times the meter will go to zero and he dies. There are more lives to be found around the mansion though so make sure that you look about. Your objectives are also clearly laid out for you and there is no guesswork as to when you've actually cleared a room. A funny part of the game that I thought was cool was that when the room has been lit, Zeke's courage meter is actually bigger as he can move about with ease. A good inclusion and a clever one that makes sense. Audio for this game is brilliant and really draws you into the game. As you would expect from Disney it's all top notch and will have you jumping with frights and laughter as the audio drags you into what is already an immersive game experience. 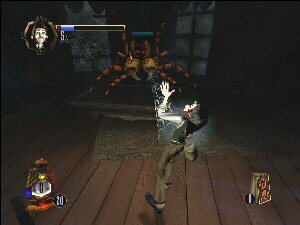 Disney's The Haunted House is a good solid game that is going to provide value for money and a gameplay experience that most are going to get an absolute blast out of, not to mention a title with tremendous longevity with several hundred ghosts to catch (about 999 - flip that one upside down folks!). Highly recommended and a guaranteed blast of fun!